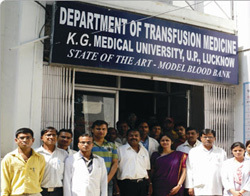 The blood bank which was initially a part of the university was taken over by the Government. Later it was transferred back to King George's Medical University in 2003. This blood bank has been presently upgraded to the Department of Transfusion Medicine by the University. The blood bank was given the designation of "State of Art Model Blood Bank" because it had the authority to supply blood to any hospital of the state. It became one of the eight of such "State of Art Model Blood Bank" in the country. Previously only whole blood was supplied till 2004. Supply of about 10 units of whole blood in 1998 progressed to 30 units in 2004. The facility of component preparation and supply was started in 2004. Department of transfusion medicine was started under the guidance of Vice Chancellor Emeritus Prof. Saroj Chooramani Gopal.